Captain Phip Watson with Michel Samson and Samson's daughter. August 14th, members of the Arichat Boat Club hosted a Meet & Greet for the Captain and crew of the Nova Scotia icon the Bluenose II. It was a lovely evening as Boat Club members, along with members of DIMA, the Municipality of Richmond and Richmond County MLA Michel Samson, made members of the Bluenose crew feel truly welcomed to the historic Acadian Island. Crew members of the Bluenose II were wined and dined in a true Cape Breton Tradition, and besides the delicious food they were treated to an excellent evening of entertainment. Some planned and some spontaneous. 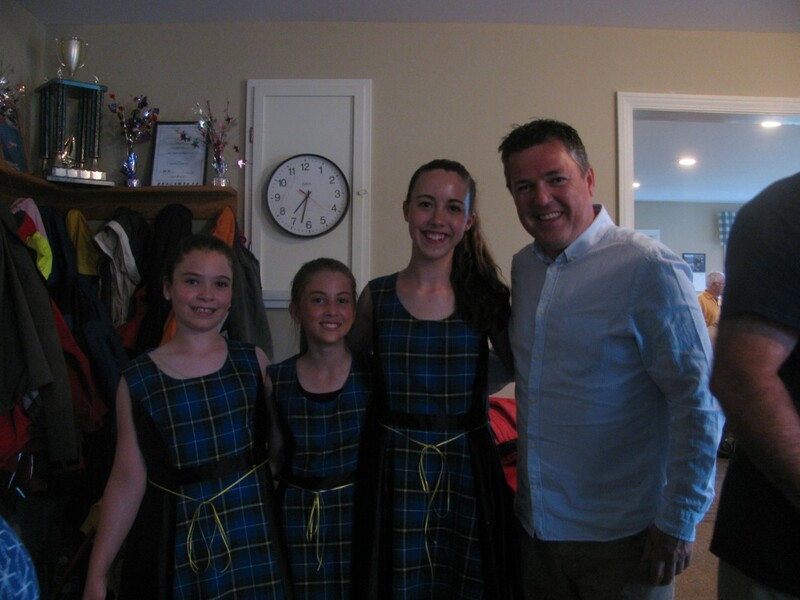 The evening was started with appetizers, served by Trina Samson Dance School dancers, Leah Boudreau, Christine Boudreau and Grace DeWolfe, who then performed a series of step dance numbers for the gathering. Kenny Petitpas and friends, who are very talented local performers from the Isle Madame performed a number of traditional tunes for the group leading up to and following the delicious seafood chowder dinner. 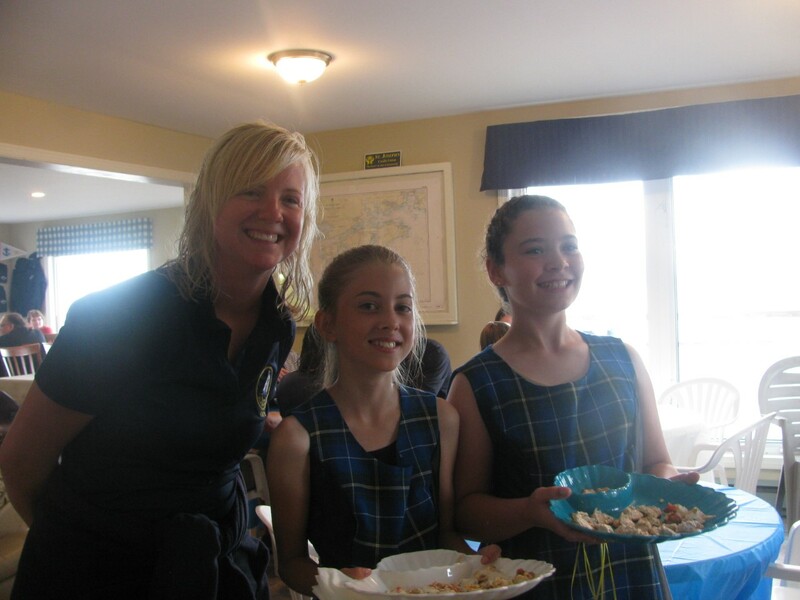 While guests enjoyed their dessert they were entertained with more entertainment by Petitpas and special singing performances by the ﻿﻿multi-talented singer and dancer, Leah Boudreau as well as an performance by three members of the Bluenose crew, which was met by the applause of the audience. During the evening there was a presentation ceremony, where gifts were presented to Captain Phil Watson and crew members. During the evening, I chatted with crew members, learning of how they came to join the Bluenose II crew and what they had learned during their sailing experience. Maria Jennings and her sister both from Alberta had gained a love for sailing after taking a sailing course in Alberta and during a trip to the east had expressed a desire to continue sailing, especially after seeing the Bluenose II in dock. Maria told me that because of her passion for the sea and sailing, she had been encouraged to apply to the Bluenose organization to become a crew member. And not only did she apply but so did her sister, and to their amazement, they had been both accepted. Their dream had become a reality and the experience they were having was above all their expectations. Maria confided it will be hard for her to picture a life now away from the sea and sailing, but would recommend the experience to any young person. She admits it is not all fun and games, there is a lot of hard work, but there is also time to enjoy the peacefulness of the sea and all the enjoyment that it brings. During time off between watches, when crew aren’t working on a maintenance project or getting some sleep, there is always time to hang out together. In tight quarters on Bluenose II, you quickly become a close-knit group. In the evenings, someone always seems to have a guitar around for a sing-along on deck, this was displayed during the evening’s entertainment as 2 young ladies, one from Alberta and one from Lunenburg were joined by a young gentlemen from Newfoundland as they joined in the musical lineup. 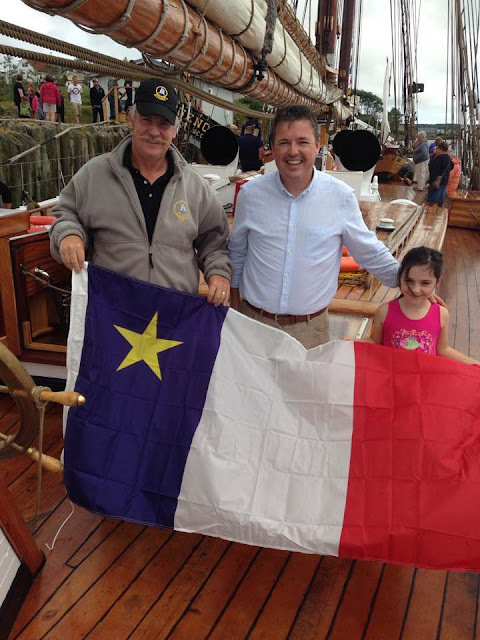 Before leaving Arichat Port, Captain Phil Watson in recognition of Fete Nationale Acadiens, was presented with an Acadien Flag by MLA Michel Samson and his lovely daughter, which was flown by the Bluenose on August 15. The Bluenose is truly an Ambassador for Nova Scotia and it is great to see her back out on tour.